Ask an average teenager what inspired their ambition, and most wouldn’t cite a television programme they happened to watch by chance – but Preethi Peramanathan would. The 14-year-old watched a Korean drama where the protagonist had a rough childhood, but studied hard to become a neurosurgeon. 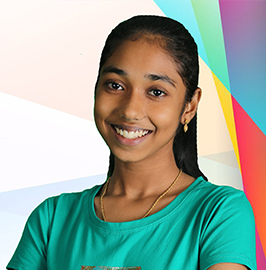 Likewise, Preethi wishes to pursue a career in a field related to medicine or science. As for Science, Preethi had a pre-existing interest in the subject, but wasn’t able to score adequately due to the way she phrased her answers. Subsequently, she sought her STEP tutors’ help on structuring her sentences to reflect key words. “Most of the questions that we came across in STEP were questions I could apply to real-life situations,” she said. Mr Nathan, Preethi’s father, is also proud of the changes he has seen in his daughter. “Previously, Preethi would use her phone excessively and ended up being distracted from her studies. Now, she is more confident in her approach towards studies, and concentrates better,” he says. In recognition of her improvement, Preethi won the Sustained Improvement Award for Mathematics and Science in September this year. She studies with her friends before major exams, saying that “more minds are better than one”. She also reviews her past worksheets and identifies areas to pay more attention to during the exams. On days when she has co-curricular activities, she reads through her notes on the way home from school.